Since version 2.2.0, we added SMTP support for user notification related out going emails. With the help of this, you can send notification emails within your own email account (say gmail). Here is how to activate them. For detailed guidance, please refer to this article. As a refresher, you need to go to Form Settings > User Notification while creating or editing a form and set a Sender’s Email to activate the user notification. Under the same options tab (Form Settings > User Notification), click on the Use SMTP Emailing button. This will give you a bunch of options to connect to your SMTP server. The host name of your SMTP server. If you have a mail server on your VPS, then it is usually the hostname of the server itself. For other popular email providers, please see the list below. The port at which SMTP server software listens to. By default it is 25. The login username of your SMTP Server. The login password of your SMTP Server. Do note that the password is stored in an encrypted form and is decrypted on the fly when requesting to the SMTP server. The same email and name you set on Sender’s Email and Sender’s Name will be used. Usually the SMTP username and Sender’s Email are same. eForm is completely compatible with Easy WP SMTP plugin by wpecommerce. You do not need to worry if you have a different email set globally. eForm will automatically disable Easy WP SMTP filters while sending it’s own email and will enable it again once it is done. 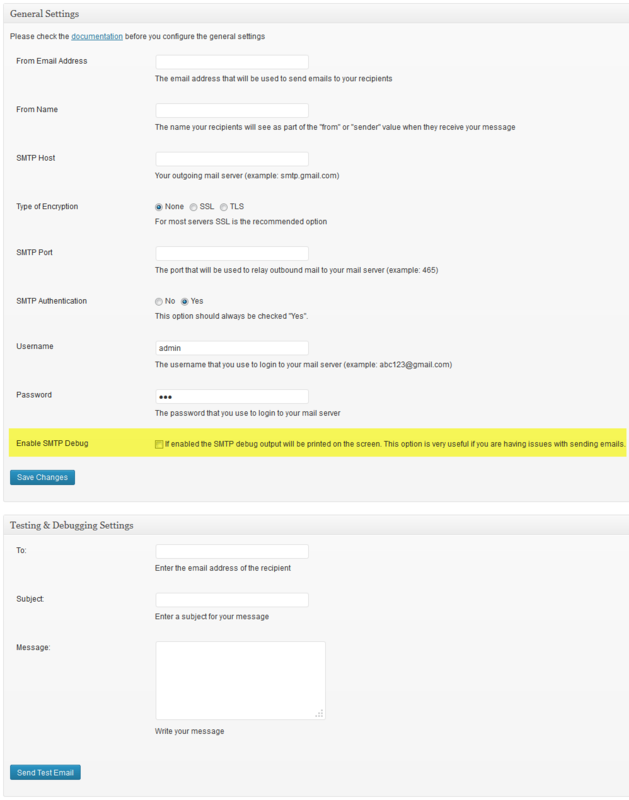 Also, admin related emails will continue to be sent from any SMTP server you set on Easy WP SMTP plugin. If you have set the Email on behalf of User option (from Form Settings > Admin Notification), then a Sender header will be added to the email sent. This will continue to work with any SMTP server unless it is forbidden explicitly. Please note that the compatibility works only with the said plugin and no other plugins. If you are using any other plugins to connect WordPress emails to your SMTP server, then we recommend uninstalling it as it may break eForm functionality. Caution: Leaving the Easy WP SMTP debug mode activated will cause Parse error while submitting a form. SMTP Username Full email address (eg, you@gmail.com or me@live.com). SMTP Password Account password (the same one you use to login).